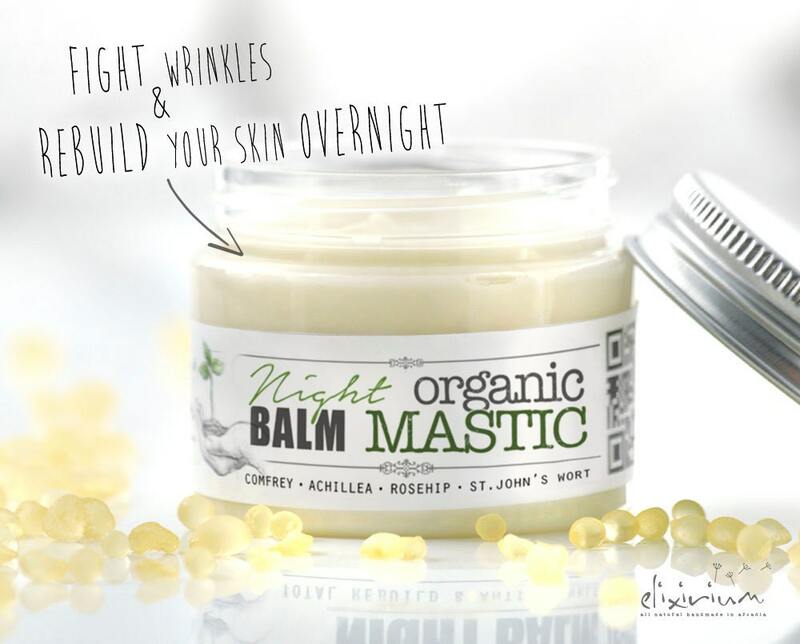 ORGANIC MASTIC Night Balm • Skin Rebuild Face Cream. 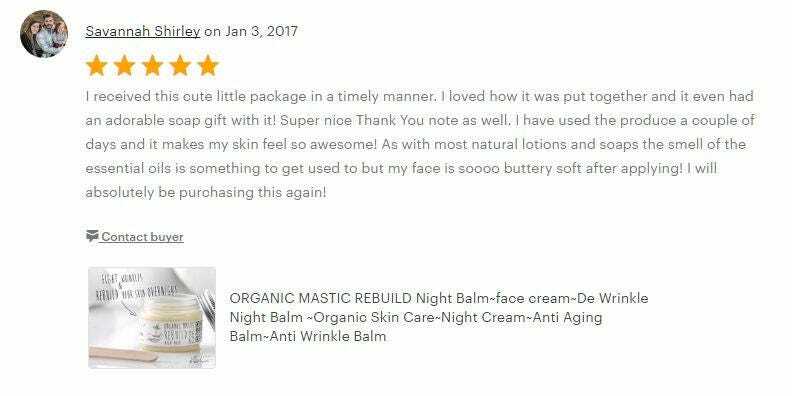 Wrinkle night balm for Anti Aging organic skincare. 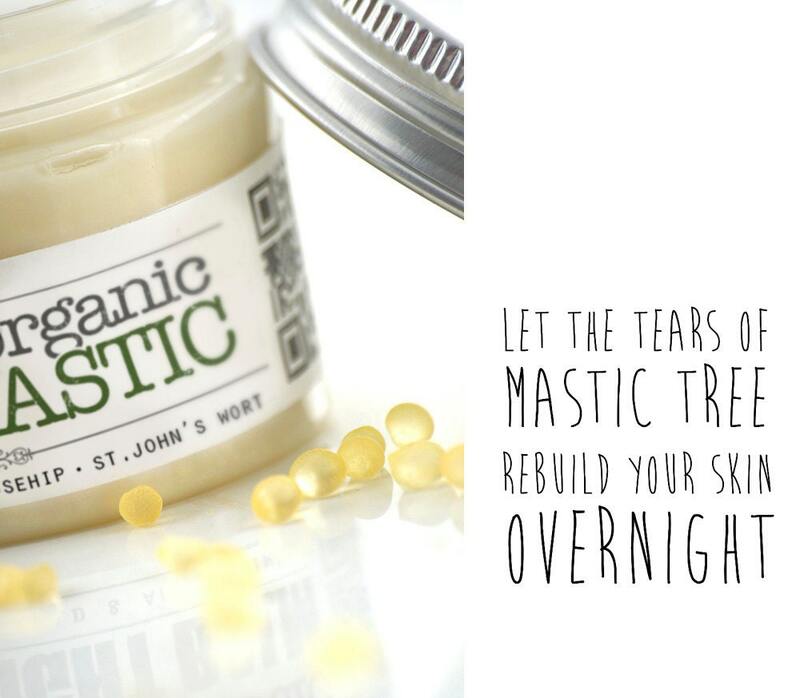 • Let the tears of mastic tree rebuild & de-wrinkle your skin overnight. • For mature complexions that need strong anti wrinkle and rejuvenation properties. An optimal, anti-aging shield for all skin types. 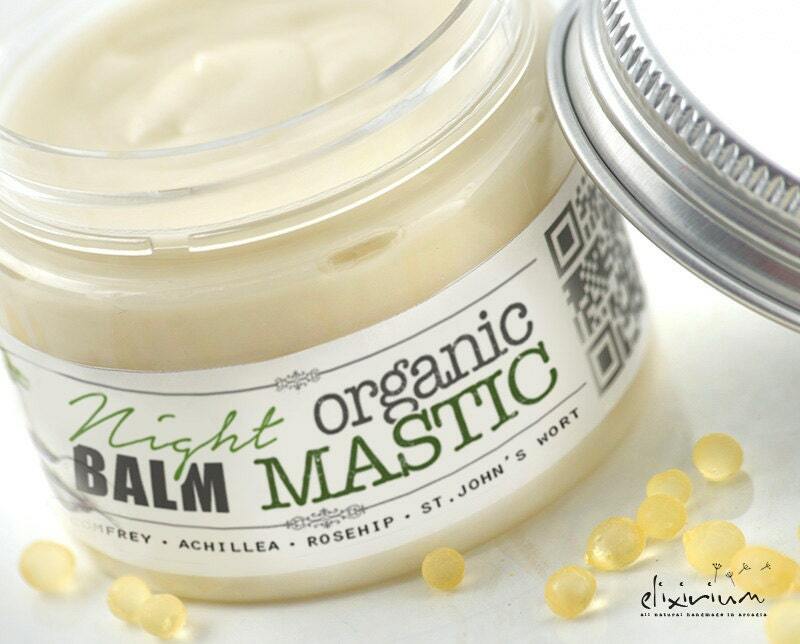 ► DETAILS : Organic mastic (Pistacia lentiscus), is the main active ingredient of this balm and really works magic for your skin. Mastic is a resin obtained from mastic trees. In Greece is known as "tears of Chios". Chios is a greek island in the middle of Aegian sea which traditionaly produces the best mastic in the world. Mastic is obtained very slowly in droplets (tears), by engraved openings on the tree's trunk. Mastic magical power is due to it's great concentration in minerals like zinc, iron and copper. Zinc, a natural antioxidant, is rensponsible for adjusting the vitamin A levels in human body so It helps to keep healthy and vivid skin cells but also promotes the natural creation of colagen resulting to complexion recast. It is as well adjusting skin's oil glands to prevent oily skin so it helps in acne situations. Moreover, Iron and copper minerals, are strong skin de-wrinkle agents, which succsefully fight wrinkles produced from ultraviolet radiation of the sun. 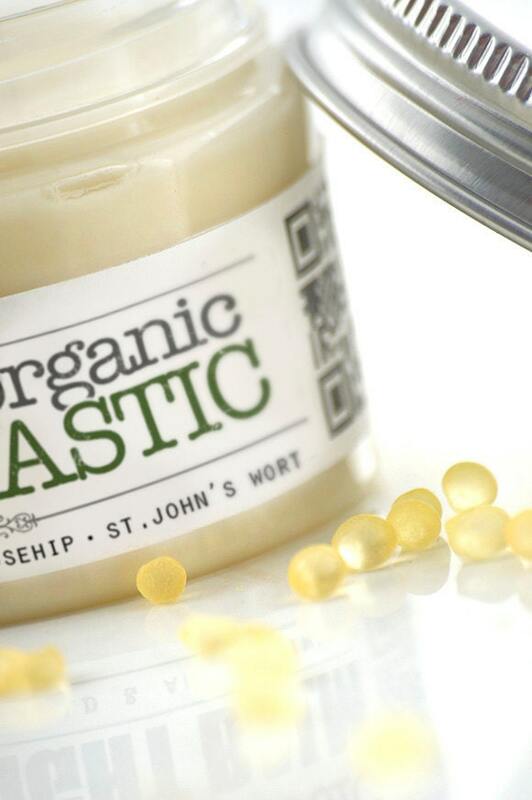 Mastic oil, a base ingredient of mastic, has outstanding skin rejuvenating properties as well as significant moisturizing action and in the same time strong anti-bacterial properties. All these together produce an active, protective film for your complexion which keeps it healthy, vivid, glowing and wrinkle free. 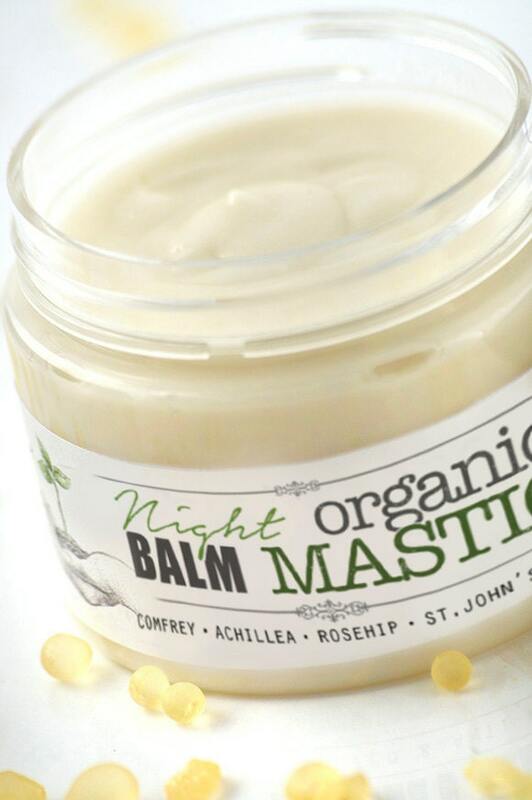 More than Mastic, ORGANIC MASTIC COMPLEXIONAL REBUILD DE-WRINKLE NIGHT BALM formula contains many more essential and organic oils like comfrey oil, rosehip, hazelnut, achillea oil and more, to add to and complete the beneficial properties of the cream. ► INSTRUCTIONS : Use and apply at night, right before you go to bed. Let it work on your skin for 6 to 8 hours as you sleep. Apply a small amount of balm with circular movements on your skin. Use the enclosed in packaging wooden stick applicator if you like not to contaminate the rest of the cream with your fingers. Rub gently until your skin absorbs the cream. I absolutely love this moisturiser. Its fluffy, whipped texture speeds into my skin and leaves me feeing soft, fresh, and well cared for. 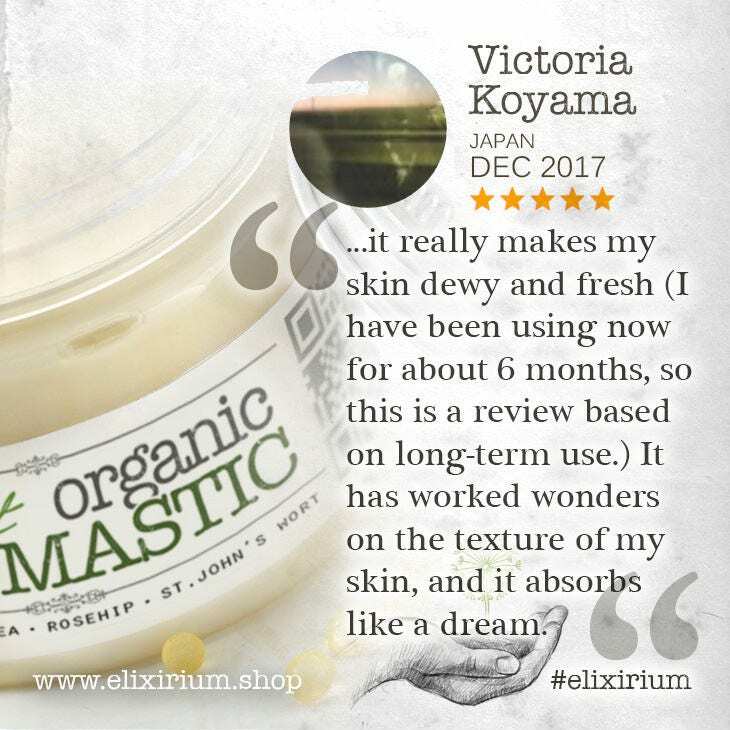 The mastic definitely works for my skin; I find that my skin has more elasticity and that peachy-bounce to it after every use. I use it during the day because my skin takes a beating in the Japanese winter. Just wonderful product. So happy to have found Elina and Elixirium!